Product Description:The new all about matt! 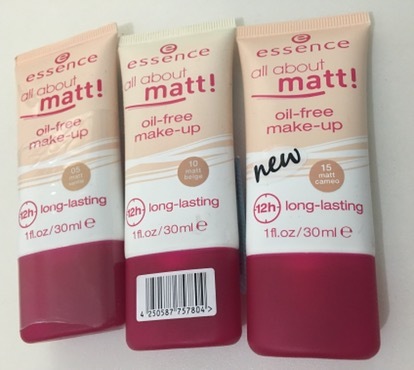 oil free make-up gives your complexion a matte effect to make it smooth and silky-soft. The long lasting formula lasts up to 12 hours and the oil-free texture would not block your pores. The new addition to the successful all about matt! range comes in a matching cool matt packaging. I have seen this brand before when I was chilling at SM Makati beauty section. Yes, the word I use is chilling. It is my happy place! I immediately thought that the price range isn’t so bad. It’s not the cheapest but not the most pricey. A friend of mine went to Thailand and I just thought of asking him to check if the price range there is pretty close or way cheaper. It is indeed cheaper there but not a lot! This costs 399 pesos at the SM beauty section. So I asked him to pick up a couple of things for me from this brand and this mattifying foundation is just one of them. For this test, I am using Matte Beige. It wasn’t that pricey so I got all 3 shades. The shade range is obviously very limited. Some women may end up mixing 2 shades to get the shade they want or may not find the shade that’s perfect for them. It is available in 1 fl.oz or a 30ml tube packaging. I think the packaging is okay but I’ve seen more appealing color combos and creative designs. Y’all know how much I love my pump liquid foundation. I just wish this came with a pump. The formula is definitely liquidy. The scent is ok. I’d say, very typical foundation smell. It is super easy to blend using a foundation brush but a sponge will work too. I do want to emphasize that this is absolutely blendable yet does not look cakey. The coverage is light to medium. I noticed that it instantly mattified my face, evened out my skin, blurred dark spots and hid some minor imperfections. 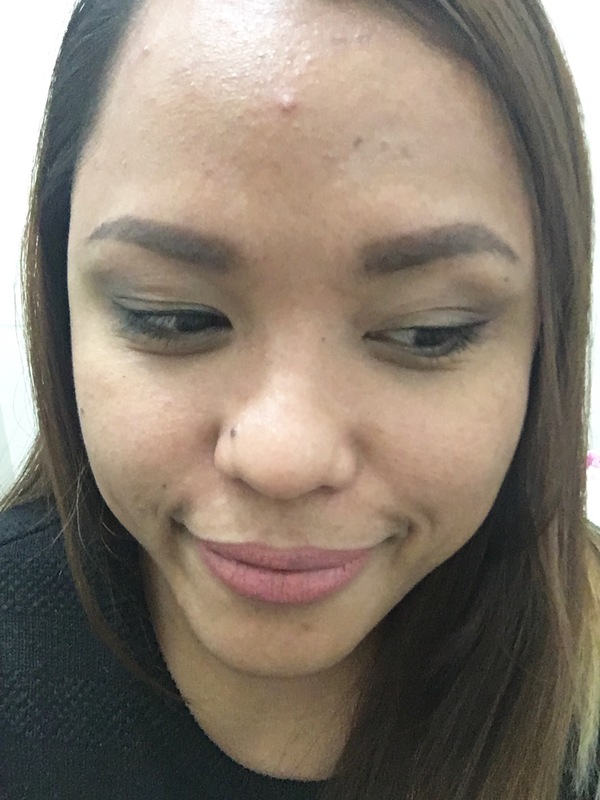 My pretty big bump in the middle of my forehead unfortunately is still there but it’s amazing how it made my face look so naturally flawless and fresh. I applied the foundation at 530PM before I went to work. At 10PM which is the 5th hour, I felt the need to blot. One thing I noticed immediately is that, the blotting paper absorbed the oil AND a little bit of the foundation. It created an uneven skin tone on my forehead area which is a 👎🏼 for me. I did blot for the 2nd time at around 1AM which is my lunch time and marked the 8 1/2 hour of wearing the foundation. Like the 1st blot, it absorbed some foundation and left uneven skintone. I was so determined to complete the 12-hour test without doing a touch up but at 230, I just NEEDED to do a quick touch up. My t-zone is just super oily. 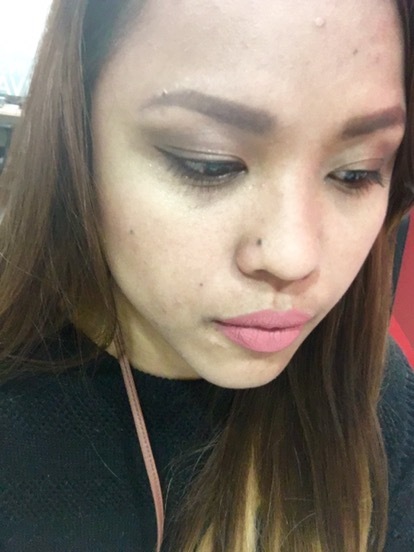 I did my 3rd blot and did a quick touch-up using my Rimmel powder. I came home at 530 which means I have completed the 12-hour test and this is what my face looked like. That is after 3 blottings and 1 touch up. 4. My face stayed matte, zero oil for around 4-5 hours which is pretty amazing. 5. It did not feel heavy at all and it did hydrate my skin nicely. My face did not dry out at any point of my 12-hour road test. Don’t forget to subscribe, like and leave a comment for any suggestions, thoughts, etc.